New Orleans charter schools after Katrina: We misunderstand them. We don’t have to. There Are No Simple Lessons About New Orleans Charter Schools After Katrina. Here’s How I Learned That. 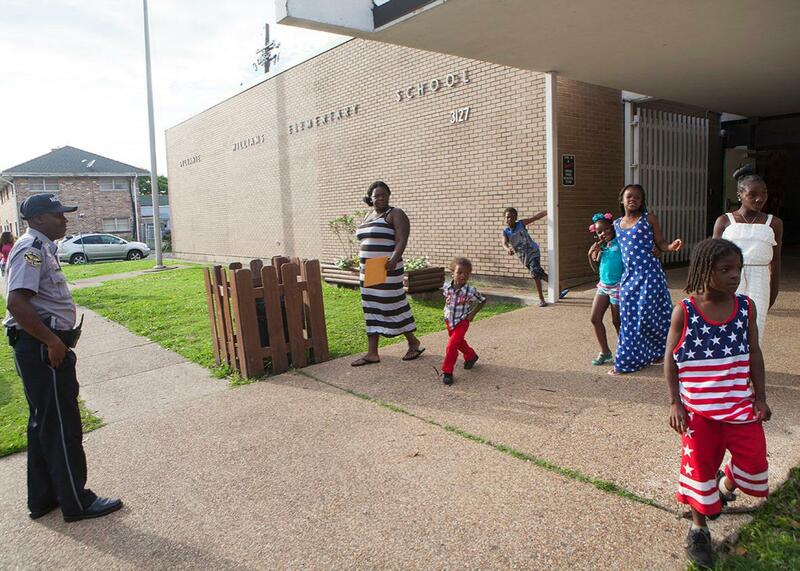 Parents and students leave after a fifth grade awards banquet and graduation on May 27, 2015, at Sylvanie Williams College Prep Elementary, a public charter school, in New Orleans. In the field of journalism, “shoe-leather reporting” refers to on-the-ground reporting: stories that emanate from homes, streets, schools, corner stores, and casual conversations. “Parachute journalism,” by contrast, occurs when a reporter relatively unfamiliar to a place or issue swoops in for a story—sometimes with the speed and detachment of a military operation. Both approaches have their time and place and merits. And they are not necessarily mutually exclusive: Great journalism has been done by those who parachute in to a community, and then literally wear out their shoes. (Amy Waldman’s thoughtful, comprehensive Atlantic piece on New Orleans schools comes to mind.) But there’s something distinctive about the story of New Orleans 10 years after Katrina—and by extension the story of the schools there—that to my mind calls for a hyperdose of locally based, shoe-leather reporting, coming from those who’ve tramped across the city time and again. After Hurricane Katrina, Louisiana’s state board of education seized control of most of the city’s schools and gradually turned them over to charter school operators; today, New Orleans is the first city in the country where nearly 100 percent of the public schools are charters. The city has become a flashpoint in the national debate over not only charters but a host of other overlapping issues: Teach for America, school closings, a relentless reliance on data and standardized testing—and just about every major reform reshaping urban education across America. The rest of the country has been looking to New Orleans as the moral compass in the debate over these issues. Thumbs up, or thumbs down? But they won’t get the most illuminating answer from the parachute reporters who lack the time, wherewithal, or desire to immerse themselves in the community and its schools. These reporters’—not to mention pundits’—tendency to focus on quantifiable results, including test scores and graduation rates, is valid and important, but less meaningful when unchecked by the on-the-ground realities that complicate and contextualize the numbers. And their proclivity to frame the issues in political terms—making sure, for instance, to talk to both a vehement charter supporter and an opponent—frequently fails to incorporate the far more nuanced perspectives of the people who matter most: educators and families. When I covered New Orleans schools between 2007 and 2014, my reporting experiences that most profoundly challenged and complicated my understanding of the successes and failures of the city’s schools (and, yes, there are both successes and failures, despite recent coverage that might suggest otherwise) could not have transpired if I had parachuted in. Years later, two examples still resonate with me—and illustrate a few of the things still lacking in our national understanding of New Orleans’ charter schools. In the spring of 2010, I followed a principal as he canvassed door to door in the city’s 7th Ward neighborhood, trying to find fifth-graders interested in enrolling in the new charter middle school he would open that fall. We knocked on one door where an excited mother eagerly noted that her teenage son, who was autistic, had been out of school for a long time. She pulled him out of one school because she didn’t feel like he was safe. Over time, she approached other schools about enrolling him. But they all declined or said they would not be able to give the teen much in the way of special education services; he talked nonstop when excited and punched his hand when frustrated. By that spring afternoon when we visited, the child had been out of school for more than two and a half years. He spent most of his days watching television and working on writing his name. Occasionally, upon spying a long-unworn school uniform in the closet, he asked his mother when he might be able to rejoin his peers at school. The principal moved on to the next house, since the autistic teenager was far too old for his school. I mentioned the family to officials at the Recovery School District, which oversees most of the city’s charter schools, and they sent a nurse out to meet with the mother. I have no idea where the mother and her son are today. But the incident taught me not only about the challenges of reaching, and serving, students with severe special needs in the decentralized New Orleans school landscape. It revealed the deep-seated disempowerment and distrust felt by a whole community of people—a distrust and disempowerment that could lead a mother to keep her son out of school for years. I also came to understand the limits of data in capturing the story of New Orleans schools. The “hard evidence” will always remain soft when an unknown number of children, out of school for any number of reasons, go uncounted in the results. A few months after the chance encounter with the school-less teen, I attended one of the inaugural parent meetings for New Orleans’ first KIPP high school. KIPP, which operates nearly 200 charter schools nationally, aims to educate low-income children of color through a structured, often discipline-heavy, approach. At the evening meeting, the principal described the school’s strict rules for comportment and behavior (an approach that is often described as “no excuses”): prohibiting students from rolling up the sleeves of their uniform shirts, putting a student on a “probationary contract” after a single suspension, instituting a “no idling” policy throughout the building. Yet several parents clamored for even more stringent discipline: You can’t be soft because you know how these kids are! Let them know you ain’t playin’. Zero tolerance, baby! I cringed a little while listening to the parents cry out for stricter rules. But the incident helped me understand the complex ways that race, culture, and history shape our needs and desires when it comes to education—in this case fostering an understandable conviction among many low-income parents of color that learning to follow “the rules” will help keep their children safe. Of course, parental attitudes are more nuanced than can be captured in a single evening; and support for many of the strictures eroded when the strict discipline failed to produce a safe and orderly learning environment at the school. Yet it struck me that most of the tensions the struggling school experienced that year were sociological rather than ideological: They concerned the challenge of bringing together people of different races and backgrounds (most of the families were low-income and black whereas most of the teachers were young, white, and middle-class) around a shared vision of what education can and should be. Yet our public debate is centered squarely on the ideological rather than the sociological. We endlessly debate the overall “worth” of various institutions—from “no excuses” charter schools to teachers unions—with a political or ideological framing. But we rarely venture inside, scrutinizing the arguably more important question of how people relate, or fail to relate, within these realms. Venturing inside—at least in a meaningful way—takes time, trust, and an open mind. I’ve practiced parachute journalism, and will no doubt do so once again in the (very near) future. But I hope that as this 10th anniversary coverage concludes, the stories told by shoe-leather reporters gain the most resonance amid the din. For one example, readers can look to the work of New Orleans journalist Katy Reckdahl, whose coverage of issues including education and homelessness invariably highlights the stories of the most affected in a compassionate way. The impact of Katrina, compared with a tragedy like 9/11, was concentrated, regional, and esoteric. It deserves to be told by journalists steeped in local knowledge and context. Moreover, the hurricane disproportionately affected some of the most powerless residents of America. These citizens’ voices must ultimately rise, unfiltered, to the forefront of public consciousness in order to bring about the radical change we need in this country, change that includes the creation of more schools that can help lift families out of poverty. But until that day, I hope for journalists who will wear out their shoes, or at least their rental-car tires, in an effort to tell those peoples’ stories.